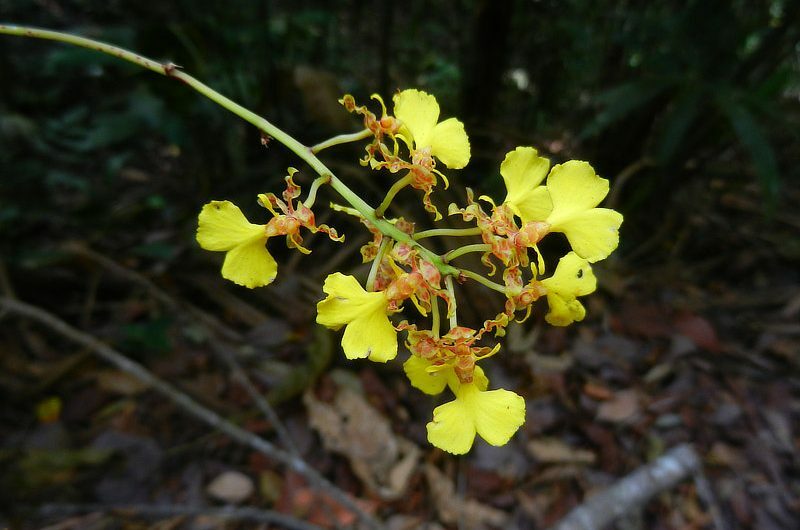 Yellow Dancing Lady Orchid Oncidium stipitatum Photo by Jenn Sinasac The genus Oncidium is a large, recognizable group of tropical orchids, containing approximately 330 species. This medium-sized, epiphytic orchid is found in the lowlands of Panama and possibly Colombia. The Yellow Dancing Lady has small cylindrical pseudo bulbs enveloped by 4-6 papery sheaths and a single, longitudinally grooved, fleshy leaf 24-70 cm long and 1 cm wide. The beautiful inflorescence consists of a single bloom stake extending horizontally from the base and terminating with many yellow and reddish-brown flowers up to 2.5 cm in length, shaped like a dancing woman wearing a fancy flamenco dress. This orchid blooms in the dry season (January – April) in the shady lowland rainforests around the Canopy Tower and Canopy Camp Darien. Pollination: Oncidium stipitatum is pollinated by a bee of the genus Centris. Scaly Tree Ferns Photo by Jerry & Linda Harrison Scaly Tree Ferns look like something out of Jurassic Park—in fact, they are ancient plants and originated in the late Jurassic. They are true ferns (Class Pteridopsida) that are rather tree-like in appearance, with trunk-like stems. The world’s tallest tree ferns are in this family, and can grow up to 20 m tall. The fronds are some of the largest in the plant kingdom, reaching 3-4 m in some species. The pinnate leaves are covered in scales and hairs; “sori” or spore clusters are located on the undersides of the leaves. They are mostly terrestrial (although some are epiphytic). Tree ferns growing in the forest understory have adapted fronds allowing chlorophyll to photosynthesize more efficiently in lower light conditions. In the family Cyatheaceae, there are 13 genera; the genus Cyathea is the largest and contains approximately 500 species, although the exact number of species is unknown. Scaly tree ferns are found in wet lowlands to mid-elevations in tropical regions around the world, and there are more than 40 species of Cyathea in Panama. From the Greek: “Cyathea” comes from the Greek word “kyatheion”, meaning “little cup”, referring to the cup-shaped sori on the fronds. Rush-like Flatsedge Cyperus luzulae Common in wetter areas around Panama, the Rush-like Flatsedge is a clump-forming, grass-like perennial member of the sedge family, Cyperaceae. 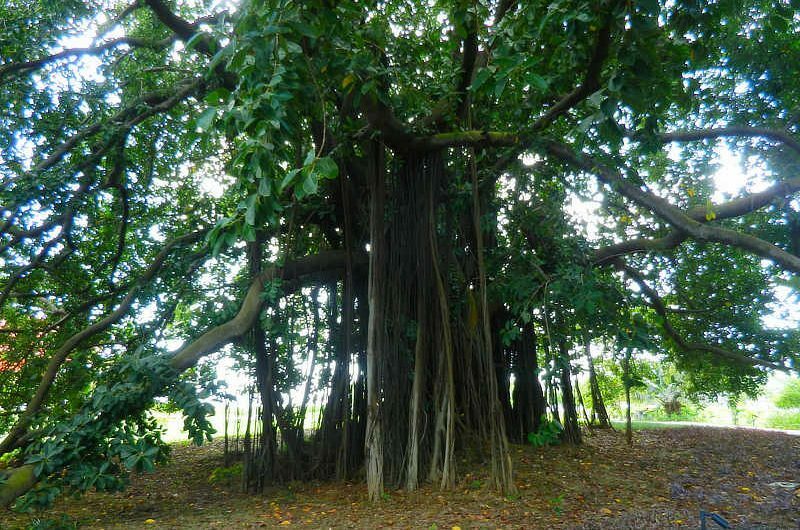 It typically grows 20-50 cm tall, with the tallest plants reaching up to 1 meter in height. The main stem of the plant grows from short rhizomes (rootstalks). Leaves are linear, 3-7 mm wide. The bracts surrounding the inflorescence are leaflike as well, growing to 30 cm in length. Numerous spikelets grow in dense clusters approximately 1 cm in diameter, bearing up to 10 or more whitish flowers. Fruits are smooth, oblong capsules 1 mm in length and light brown in color. Cyperus luzulae flowers and fruits throughout the year. The Rush-like Flatsedge has a number of useful purposes by humans. The crushed rhizome is used as an aphrodisiac. The strong, flexible stems can be used as twine. 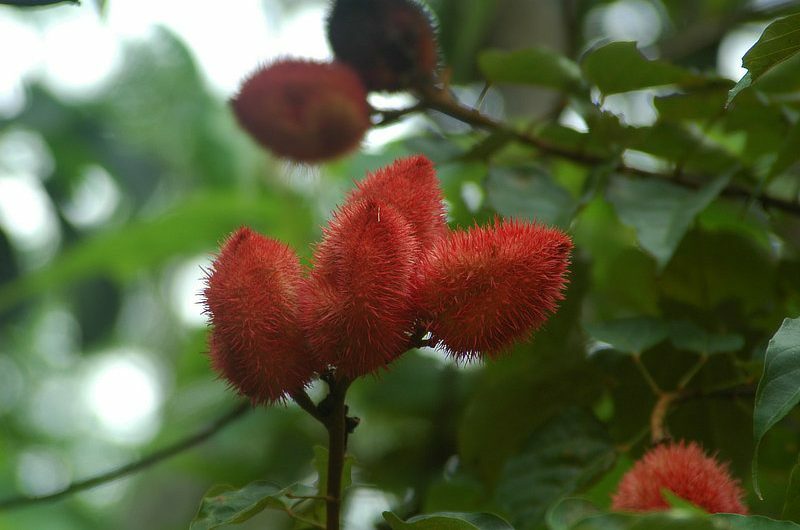 Parts of the plant (likely the rhizome) is mixed with Genipa americana (Jagua – family Rubiaceae) and is rubbed on hair to encourage and maintain healthy hair growth! 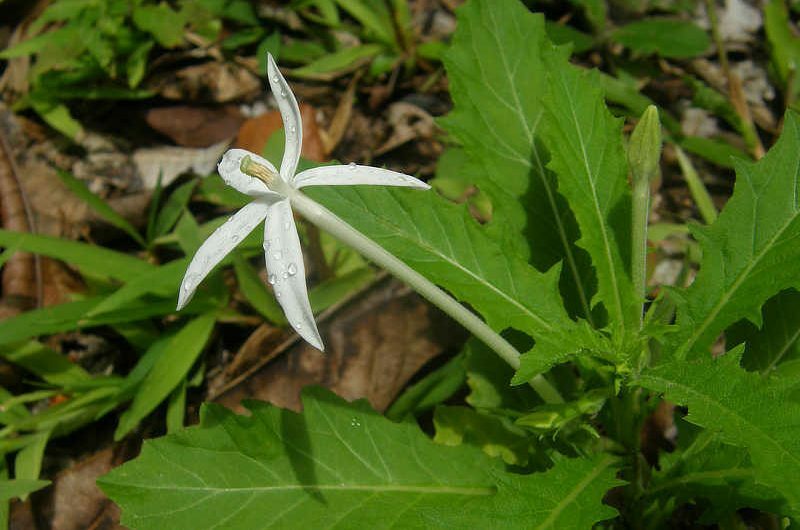 This distinct plant prefers wet habitats, and can be found commonly in marshes and swamps, wet fields and stream edges. It is found in the lowlands and foothills up to 1400 m. elevation, in tropical moist forest and premontane moist forest. Cyperus luzulae has a wide distribution throughout the tropical regions of Central and South America. The genus Cyperus contains approximately 700 species of sedges distributed worldwide. The species name “luzulae” comes from “Luzula,” a genus of rushes (family Juncaceae) which this species resembles. Tropical Milkweed Asclepias curassavica Photo by Jenn Sinasac Commonly known as Tropical Milkweed, Scarlet Milkweed and Blood Flower, this plant is a member of the family Apocynaceae, the dogbane family. The genus Asclepias (the milkweeds) are named after Asclepius, the Greek god of healing, for the many medicinal uses of the milkweed plants. As their common name suggests, they have milky sap, of many species contains toxins and can cause injury. Tropical Milkweed is an evergreen perennial shrub. It grows to 1 meter tall and has pale gray stems. The leaves are oblong and end in a sharp point at the tip, and are arranged oppositely. The inflorescence has 10-12 flowers with red corollas and yellow or orange petals, and flowers all year round. Fruits are 5-10 cm long, and contain small, flat, oval seeds with silky hairs for wind dispersal, similar to other milkweeds. Tropical Milkweed is a source of food for many species of butterflies, and like other milkweeds, particularly for both larvae and adult Monarch and Queen butterflies (subfamily Danainae), and is a favorite flower for planting in butterfly gardens. Tropical Milkweed is native to the Neotropics, and has been introduced to other tropical regions worldwide. It can be found throughout the forests of Panama. 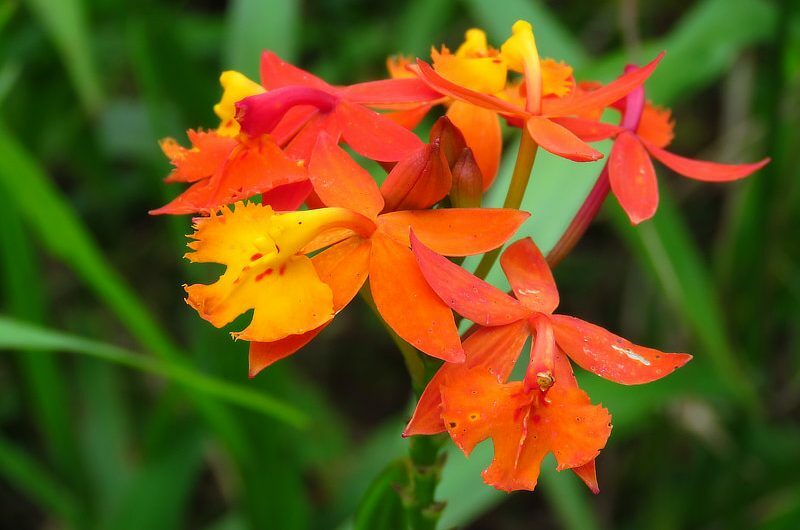 Spanish Flag Orchid Epidendrum radicans Photo by Jenn Sinasac A “weedy” orchid, common along the roadsides and fields of middle elevations in Central America, the Spanish Flag Orchid is rather eye-catching and distinct.